See what our newly wed couples have to say about celebrating their Wedding at Mantarays Ningaloo. Just wanted to send a personal thanks to Jennifer Robinson for helping me organise the Ramsey wedding. We had the most amazing week and more importantly the most amazing wedding day. After all the planning and emailing back and forth, we couldn't have asked for anything more. It was absolutely perfect! A couple of our friends said it was the best wedding they've been to and that of course reflects on the help and hospitality of the staff at the Novotel. To Darren and staff who ensured our stay up to the wedding and the nights beyond was everything we could have dreamed of and more. The service was second to none and our guests commented on how friendly and accommodating the staff were. Also we were all so impressed by the food served on the night. It was delicious and thanks for sending us wedding cake room service! And lastly, a special mention for Natalia, who looked after our table on the night, and served us cocktails by the pool.  We were never left standing with an empty glass and I'll remember her friendly face every time I think of our special night! I was sad to leave, but we'll be glad to come back and visit you all again! Rob and I would just like to thank you for making our wedding reception the wonderful event we had hoped it would be. We could not be happier with the reception. The room looked amazing. Staff were absolutely fantastic! They went above and beyond to ensure everyone was catered for at all times. Glasses were always full and service was exceptional. It was the little details too - the way the bar staff stopped and cheered along as the bridal party entered, and the waiter who served the bridal table called me Mrs Fulton all night! Those things were the little details that made the service you provided not just great, but really special. The food was delicious. Many guests commented on the food and how delicious it was. The beef in particular received rave reviews, and our vegetarian guest was delighted with her meal too. Every step of the way, from the initial query, right through to the event itself, you and all the Novotel staff we communicated with made it an easy, stress free process. There was not a detail that you didn't cover and not a single element out of place. I would highly recommend your venue to any bride who is considering Exmouth. So thanks again for making the most special evening of our lives so far as amazing as it was. It's a night we'll never forget and we wanted to thank you for all you did to make sure it went off without a hitch. We cannot thank the Ningaloo Novotel Resort Team enough for making our special day a magical one. We had our ceremony on Sunrise Beach located directly behind the Resort and our Reception at Lily Pond Terrace. This arrangement was convenient for our guests as they could enjoy the Resort whilst drinking champagne and treating themselves to the scrumptious canapés while the Bridal Party ventured off for photos. The Novotel Team and Jess from Salt and Sand Event Hire took control of the day allowing us to relax and soak up every moment. Planning our wedding day from Day 1 was a wonderful and non-stressful experience as Alana and Jess were so accommodating and they had wonderful ideas. Our day was beyond perfect and we highly recommend holding your special day at the Resort. Our guests are still talking about!! We had the most amazing day and the Novotel made it even better and stress free. The staff did an amazing job. All our guests said the staff were efficient and they were very conscious of any requested dietary requirements. Food was excellent and guests couldn’t stop talking about how perfect the steak was cooked and how delicious the desserts were (except I didn’t eat mine too busy chatting). Alana you were the absolute best wedding planner ever. You could not have done anything to make our day more perfect, even in the lead up you always helped me with any questions no matter how silly they were!! So thank you so so much, we really did appreciate it. Vee was an amazing videographer and the video is great. I would recommend her any time. I hardly noticed she was there and some how she has managed to capture every moment of our wedding. Also we were super happy with Laurie’s music. No one wanted to leave haha!!! 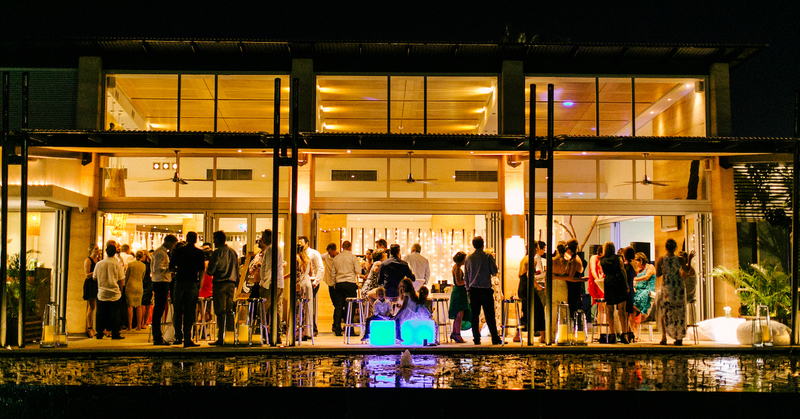 What a great experience it was, organising and holding our destination wedding weekend at the Novotel Ningaloo Resort on 6 September 2014. Alana Salmon, Front Office Manager, and the Novotel team, provided an exceptional service throughout the entire process. From the initial meeting, to food tasting, to the actual weekend and wedding day; the service and coordination of events was impeccable. Organising a destination wedding can be challenging, however; the frequent and prompt communication, attention to detail, and flexibility and openness to our ideas, was a standout. On the day, we were left to enjoy ourselves, whilst the Novotel team took care of everything. We have received many comments from guests on the amazing food, stunning reception venue which oozed ambience, and the gorgeous location which made for some very special photographs. A special mention to the bar staff, who happily made hundreds of cocktails (literally) which were a big hit throughout the weekend.. I have no hesitation in recommending the Novotel Ningaloo Resort as a wedding venue and the accommodation for guests is wonderful too. A big thank you to all the staff and management at the Novotel Ningaloo Resort (especially Darren) for all their involvement in our wedding, not only on the day but in the lead-up to the event. We had the most beautiful wedding day and we were very lucky to have the opportunity to use the spectacular poolside venue, which overlooks the beach, for our cocktail reception. The chefs of Mantaray's restaurant created exquisite canapés throughout the night for our 100 guests and the attentive waiters made sure that everyone had a full glass at all times. The service was outstanding. The hotel and it's setting is simply breathtaking. We wouldn't have chosen anywhere else in the world to get married. So thank you again to all involved in our big day.